For more than a decade, Dr. Marc Chhina has been treating patients at both the San Leandro and Castro Valley, California offices of Creative Dimensions in Dentistry. He provides expert dental services, including teeth whitening, veneers, crowns, bridges, dental implants, dentures, and more. 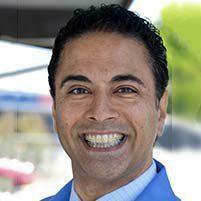 Dr. Chhina received his doctor of dental surgery degree from New York University School of Dentistry in 1999. He served in the U.S. Navy as a Dental Officer for three years. He has extensive training in cosmetic, implant, and oral sedation dentistry. Dr. Chhina is a fellow in the International Dental Implant Association, and is a member of the American Dental Association, California Dental Association, Academy of General Dentistry, DOCS Sedation, and Kois Institute. Born and raised in the East Bay, he enjoys being part of the Creative Dimensions in Dentistry family where he has practiced since 2007. He is married to a dentist, and they have two wonderful daughters and a very playful Labrador. You can schedule an appointment with Dr. Chhina by calling the practicing or by booking online today. "It was a great experience and I really don't like anything that has to do with Dentistry but Dr. Chhina was great and made me very comfortable with the entire process." "It was great! The reception was quick and easy, my son was seen in minutes and Dr. Chhina fixed his filling in minutes as well. Awesome experience." "Marc Chhina and his magical team used preventative measures to save my gums and today I have healthy teeth and a smile I am proud of."